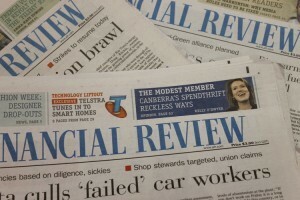 Australia’s leading source of business and finance news and information, The Australian Financial Review, has strengthened its Leadership category with a new editorial and commercial offering ­ spanning afr.com, print and events -­ bringing to life the people leading change and the ideas creating value. Leadership on afr.com is a must-­read ­- with Management, Careers, Workplace, Innovation and Entrepreneur sections. From March 21, it will be accompanied by a new dedicated Leadership section in the newspaper -­ Leadership Careers on Mondays, Leadership on Tuesdays, including the popular column by the Financial Times’ Lucy Kellaway, and Leadership Entrepreneur on Thursdays. BOSS magazine Editor Joanne Gray takes on additional responsibility as Financial Review Leadership Editor, overseeing the expanded and enriched offering, building on the franchise developed by the Financial Review’s premier leadership publication, BOSS magazine ­ which continues as a monthly newspaper insert magazine. Michael Bailey has been appointed Financial Review Entrepreneur Editor to drive Leadership’s coverage of new thinking, big ideas and provocative reads for startups, venture capitalists, investors and leading entrepreneurial minds -­ across afr.com and a new Entrepreneur section in the newspaper on Thursdays, starting March 24, which replaces Enterprise. Entrepreneur will complement the long-­running technology section, edited by Paul Smith, in Tuesday’s paper. Stories from BRW’s deep editorial archive are now accessible on afr.com, including the highly valued and popular BRW lists -­ Rich 200, Young Rich and Fast 100 -­ which continue to carry the BRW brand and are published in the Financial Review, along with other popular lists such as Financial Review Most Innovative Companies. BRW lists will be freely available at afr.com/leadership/brw­lists. “Entrepreneurship and startup culture are no longer just happening on the fringes of Australian business. Large corporates are taking inspiration from this dynamic sector, and I’m pleased to be helping the Financial Review uncover the stories of these job­creators,” Entrepreneur Editor Michael Bailey said. The Australian Financial Review Leadership series of events will be launched through the inaugural The Australian Financial Review Business Summit with BHP Billiton to be held in Melbourne on March 15 and 16. The ‘Risk Takers, Growth Makers’ Business Summit will feature Australia’s leading company executives, board members and entrepreneurs, including Westfield founder Frank Lowy, Telstra chair Catherine Livingstone, Wesfarmers chief executive Richard Goyder, Atlassian co­founder Mike Cannon­Brookes, BHP chief executive Andrew Mackenzie and digital entrepreneur Paul Bassat. Treasurer Scott Morrison will give the opening keynote address. The Summit will focus on the importance of leadership in dealing with the opportunities and challenges thrown up by the forces reshaping the nation’s business landscape. See www.afrsummit.com for details.